Abstract A mini-report of a study. Abstracts are readily available for free, full texts of studies can be more difficult to obtain. Bias Intentional or unintentional molding of a study design or results to fit a preconceived notion of the researcher. Ethics Moral guidelines for conducting research. Can sometimes make conducting research tricky, but ethics are essential to appropriate research. Generalizability The ability to apply the results to the larger population. A study that shows high miscarriage rates in women over age 40 cannot represent miscarriage rates in the general population. It has limited generalizability. A study that shows miscarriage rates in a sample that is similar to the general population be much more generalizable. 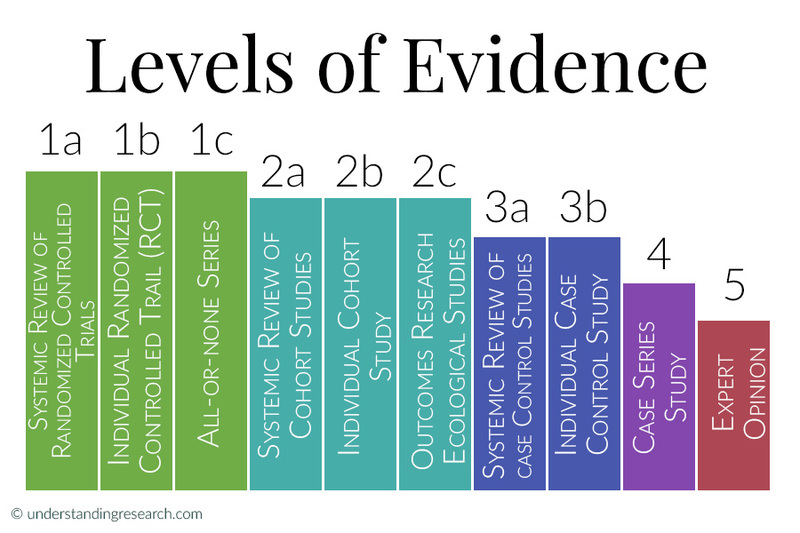 Level of Evidence Many studies are starting to include a notation on the level of evidence in the abstract. This refers to a system developed by the Center for Evidence Based Medicine to rank studies based on their strength. Levels range from 1a (strongest) to 5 (weakest). More details can be found at the CEBM web site. Placebo Effect Psychological effect where people taking a fake substance report health benefits. Can cause problems in study results if control group gets nothing. How do you know results are from intervention and not placebo effect?